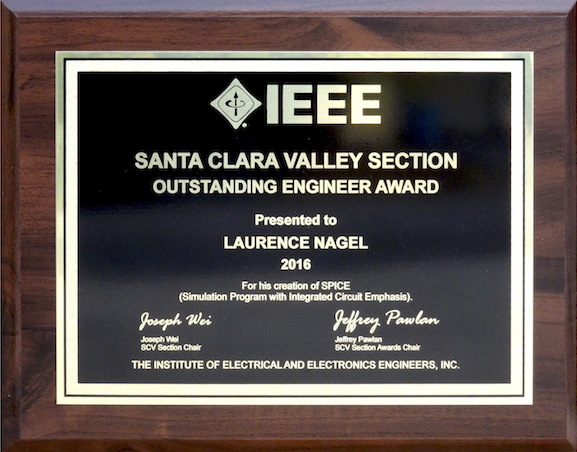 The IEEE-SCV presents this award to Laurence W. Nagel for his work from 1969-71 in the creation of SPICE (Simulation Program with Integrated Circuit Emphasis), the first software to combine DC, AC and transient analog circuit analysis capabilities. SPICE has achieved world-wide acceptance, spawned the Computer-Aided Design (CAD) industry for IC and board-level design, and was an early open source software initiative. 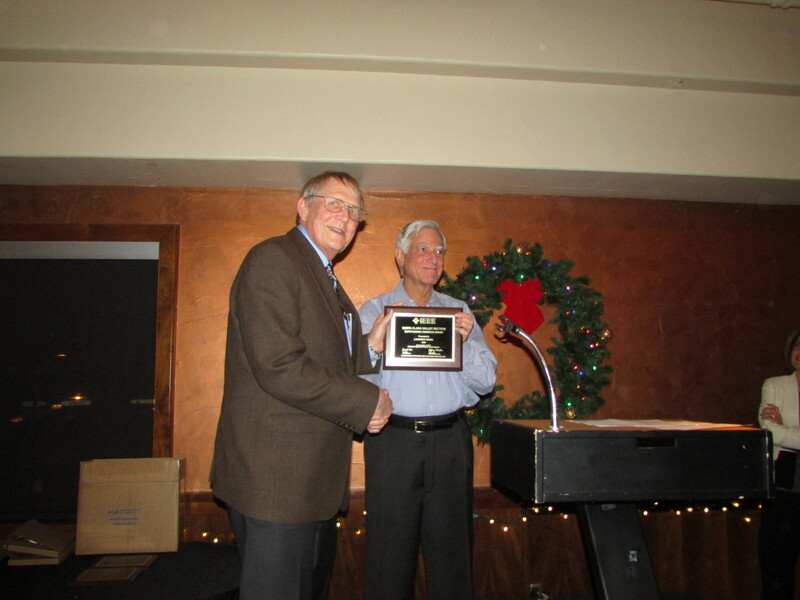 Larry was awarded two awards for Outstanding Engineer; one for IEEE – Santa Clara Valley Section, and one for IEEE, Region 6. 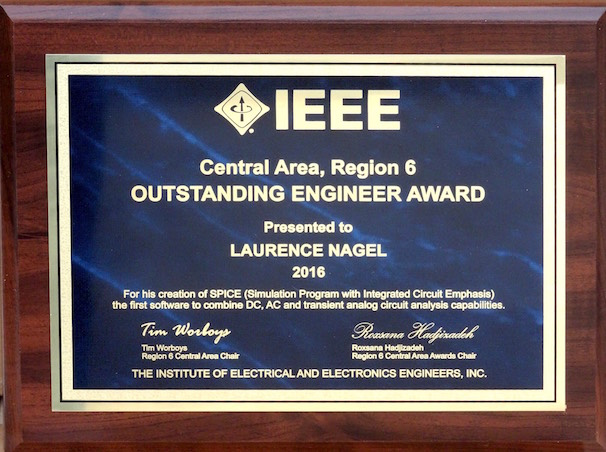 Laurence W. Nagel, PhD is a respected expert in Analog circuit design, Computer-Aided Design (CAD), circuit simulation (SPICE) and semiconductor device modeling, and is a respected expert witness in patent litigation and trade secret cases. In 1998, Dr. Nagel founded Omega Enterprises Consulting, which offers consulting services in analog and RF integrated circuit design, device modeling, circuit simulation, and expert witness work in patent and trade secret litigation. In New Jersey, Larry was a member of the CNNNJ (Consultants’ Network of Northern New Jersey) from 1999 until 2008, including three years as Secretary. He joined the IEEE Consultants’ Network of Silicon Valley (IEEE-CNSV) in 2009 after he moved back to California Larry was CNSV Chair in 2010-2011 and a CNSV Director from 2012 to early 2016, and is currently Secretary. Larry remains active elsewhere in IEEE, and presently serves on the technical program committee for the Custom Integrated Circuits Conference (CICC). The SPICE Circuit Simulator was named an IEEE Milestone on February 4, 2011. Simulating a circuit with SPICE is the industry-wide standard way to verify operation at the transistor level before manufacturing an IC. The program has become so ubiquitous that engineers often say they are going to “SPICE a circuit” when they are about to test one. To mark the 40th anniversary of SPICE—the Simulation Program with Integrated Circuit Emphasis—IEEE has designated its creation an IEEE Milestone in Electrical Engineering and Computing. PROMINENT ROLE The process of making an IC is expensive, and probing the behavior of internal signals is difficult. SPICE checks the integrity of circuits and predicts how they will behave before anything is manufactured. Simulating a circuit involves using mathematical models to replicate its behavior. Simulation can determine problems in the design early on, leading to a better final design and significant cost savings. Almost all IC design relies heavily on simulation. IC designers aren’t the only ones using SPICE, though. It is part of engineering curricula to help teach students the fundamentals of circuit design. In fact, the classroom is where SPICE was developed. STUDENT DEVELOPERS The program began as a class project in 1969 for a circuit design and analysis course taught by Ronald A. Rohrer, a professor at the University of California at Berkeley. Rohrer, an IEEE Life Fellow, said the best way for his students to learn the subject was to do hands-on work, so he assigned them a project to develop a comprehensive IC simulator. The students were told they would pass only if their program impressed Donald O. Pederson, a professor of electrical engineering and computer science at the university, and a pioneer in transistor research. Pederson, for whom the IEEE Donald O. Pederson Award in Solid-State Circuits is named, was instrumental in establishing the first IC fabrication lab at UC Berkeley in 1960. At the time, IC fabrication labs were found only in high-tech companies, so the Berkeley lab was the first to give students hands-on experience. At the end of the course the students had indeed developed a simulator and gave it a rather unusual acronym: CANCER (computer analysis of nonlinear circuits, excluding radiation). The name— particularly the words “excluding radiation”—were purposely defiant, because at the time, circuit simulation programs were typically funded by the government for defense purposes and were required to include a feature to test a circuit’s resistance to radiation. CANCER was the first simulator to use sparse matrix techniques, which made it possible to simulate greater orders of magnitude. Pederson was impressed with the students’ efforts, and they all received passing grades. But Nagel’s work on the program didn’t end there. He focused on improving CANCER for both his master’s and doctoral theses. Rohrer was his advisor for his master’s thesis, and Pederson became Nagel’s doctoral advisor. CANCER TAMED Pederson’s goal for Nagel was to redevelop CANCER to make it a public-domain, general-purpose circuit simulator—and to change its name. The result was SPICE, the first program to combine the circuit-analysis capabilities of DC analysis, AC analysis, and transient analysis. SPICE was made publicly available in 1971 so that chip designers could modify it—an early example of open-source software. Two years later, SPICE became well known after it was described in a paper by Pederson at the 16th Midwest Symposium on Circuit Theory, in Waterloo, Ont., Canada. During the next few years, developers around the world began using and modifying SPICE, leading it to become the industry standard it is today. SPICE (Simulation Program with Integrated Circuit Emphasis) is a general purpose circuit simulation program that is used by electrical engineers in the design of integrated circuits. Although SPICE was released to “friendly users” in the fall of 1971, the rest of the world didn’t learn about it until Professor Donald O. Pederson of the University of California, Berkeley presented our SPICE paper at the Sixteenth Midwest Symposium on Circuit Theory on April 12, 1973. I don’t think anyone had a clue of the impact of that paper or the computer program it described. While we all had modest expectations for SPICE, what happened was truly phenomenal. Within a few years, SPICE had achieved acceptance at almost all electrical engineering schools and had started a cottage industry to supply SPICE derivatives to the rapidly expanding integrated circuit industry. SPICE was the latest of circuit simulation programs to be developed at UC Berkeley and followed in the steps of BIAS, SLIC, TIME, and CANCER, as well as numerous other lesser known programs. The first version, SPICE 1, was a follow on to CANCER (Computer Analysis of Nonlinear Circuits, Excluding Radiation) which was announced in a paper presented by Professor Ronald A. Rohrer at the 1971 International Solid State Circuits Conference. CANCER was developed in an era when many circuit simulation programs were developed by large corporations with government contracts and were required to have a simulation capability that could evaluate the radiation hardness of a circuit. The name CANCER was a bold statement that this program never would simulate radiation and was not funded by the defense industry. It was, after all, developed at Berkeley in the sixties! CANCER began as a class project of a series of courses taught by Ron Rohrer. The course was about circuit simulation, and Ron, always an innovative teacher, figured we would learn a lot more by doing than by listening to him lecture. The rule was that as long as Don Pederson approved of the program, we all passed. My classmates in this unique learning experience were Bob Berry, Shi-Ping Fan, Frank Jenkins, Jesse Pipkin, Steve Ratner, and Lynn Weber. I was put in charge of showing the program to Don Pederson and gaining his approval, probably because I had worked closely with Don in the past and everybody wanted to pass this course. Ron Rohrer’s class project idea was a smashing success. We developed a sparse matrix solver that allowed us to simulate circuits orders of magnitude larger than previous programs could handle. The use of implicit integration algorithms provided a much more robust transient analysis capability. Like BIAS and SLIC, CANCER had built-in models for semiconductor devices, so the user need only provide a set of model parameters as opposed to providing FORTRAN routines to model the devices. We also introduced adjoint solution methods to allow rapid sensitivity analysis and noise analysis. When the course was over, Don Pederson gave his hearty approval, we all passed, and CANCER became my Master’s project. 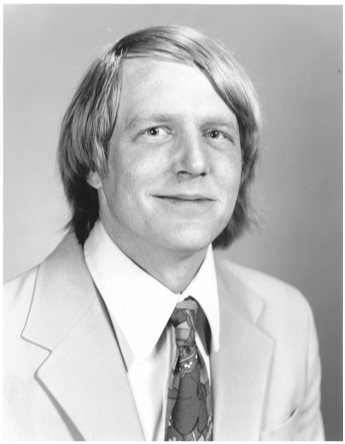 The program was used heavily in undergraduate and graduate courses at Berkeley, largely because of Don Pederson’s wholehearted support, and that gave me plenty of opportunity to improve the robustness of the algorithms for circuit simulation. Ron Rohrer and I spent many hours brainstorming and improving the program. Ron left Berkeley to work in industry about the time I finished my Master’s project. There was still much to do, and I began my doctoral studies with Don Pederson as my thesis advisor. The name CANCER was not the most popular in the industry, mainly because of the medical implications, so my first job was to find a new name, and that’s how SPICE 1 was born. My doctoral research enabled me to pursue vigorously the algorithms of circuit simulation and to completely rewrite the original CANCER code to create the second version, SPICE 2. During this work, I had the privilege of having Ellis Cohen as an office mate. Ellis is the unspoken hero of SPICE. He was much more computer oriented, and taught me a lot about data structures, memory management, and program architecture. I finished my doctoral research at the end of 1974, and Ellis took the lead in improving the version of SPICE that I developed (SPICE 2B) to the industry standard SPICE 2G6, which was released in 1983. Laurence W. Nagel and Ronald A. Rohrer, “Computer Analysis of Nonliinear Circuits, Excluding Radiation,” IEEE Journal of Solid State Circuits, vol SC-6, pp. 166-192. L. W. Nagel and D. O. Pederson, “SPICE (Simulation Program with Integrated Circuit Emphasis), “ Memorandum No. ERL-M382, University of California, Berkeley, Apr. 1973. Laurence W. Nagel., “SPICE2: A Computer Program to Simulate Semiconductor Circuits,” Memorandum No. ERL-M520, University of California, Berkeley, May 1975. Laurence W. Nagel, “The Life of SPICE,” presented at Bipolar Circuits and Technology Meeting (BCTM), Minneapolis, MN, September 30, 1996. Laurence W. Nagel, “Y2K – A SPICE Odyssey,” presented at 2000 FSA Modeling Workshop, San Jose, CA, October 12, 2000. Nagel, Laurence W., “The Life of SPICE,” presented at a meeting of the Princeton ACM and IEEE Computer Society, Princeton, NJ, January 15, 2004. Laurence W. Nagel, “Is It Time For SPICE4?” presented at the 2004 Numerical Aspects of Device and Circuit Modeling Workshop (NACDM), Santa Fe, NM, June 23-25, 2004. Laurence W. Nagel, “Donald O. Pederson: Professor, Visionary, Friend,” presented at the CANDE Workshop, Santa Cruz, CA, September 9, 2005. Laurence W. Nagel, “The Life of SPICE,” presented at a meeting of the Consultants Network of Silicon Valley, Santa Clara, CA, June 9, 2009. Laurence W. Nagel, “The Life of SPICE,” presented at ENGR10 class, Chabot College, Hayward, CA, October 25, 2011. 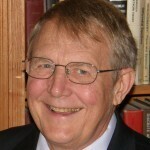 Visit Dr. Nagel’s Website at omega-enterprises.net, his CNSV profile, and LinkedIn page.